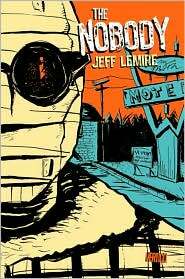 The Nobody is Jeff Lemire’s take on the classic H.G. Wells tale of The Invisible Man. In Lemire’s tale the invisible man arrives in Large Mouth (population 754) sporting mummyesque bandages and a troubled past. Of course he captures the attention of Vickie, a bored teen who works in her dad’s diner, and the rest of the town. They don’t cotton to mysterious strangers in Large Mouth. John Griffen lands in the small town because he’s fleeing the death of his wife and some weird chemistry accident that has rendered him invisible. He spends his time cooped up in a Large Mouth motel trying to forget and come up with an antidote. Vickie brings him food all the time and tries to become his friend. There’s all sorts of weirdness in this tale and when a woman goes missing things get even worse for our invisible man. While the art here is beautiful, all done in blue, black, and white, and really plays up the noir aspect of the story, I have to admit the story just doesn’t work well. I’m not sure if it’s supposed to be filled with surprises and twists, because none of it was very surprising. In fact it all seemed a little, well, played out. It’s a shame too because one of things I loved so much about Lemire’s Essex County was that the story was as original and well-told as the art. With only one half of the equation, The Nobody kind of comes off as a big, dull dud.